2001 OREGONIAN Portland OR (Katy Muldoon)..."When the drums go tap, tap, tap the clicks of the Orca call. When piano notes whisper, crest and crash, like a killer whale breaching at sea. Together, they form an instrumental jazz tune call "Keiko's Dream". Together they illustrate Theresa Demarest's awakening as a musician with a message - a singer-songwriter who yearns to be a voice for the oceans an especially a voice for Keiko...... jazz blues neo-Folk Fusion. and Orca. 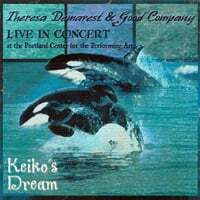 Especially Orca"
2000 PORTLAND CITYSEARCH (Curtis Waterbury, Music Editor): Theresa Demarest's latest CD titled "KEIKO'S DREAM" is her "...strongest effort yet. Demarest has always crafted a good song-her unique rhythmn guitar work, country-style vocals and endearing lyrics blend together perfectly ..Besides the great infusion of jazz, blues, and folk, "Keiko's Dream also represents the next step in this singer-songwriter's evolving career....Good Company indeed". I love the Keiko's Dream CD...terrific performers and wonderful music!